The Photovoltaic Power Profile Emulation (PPPE) software automatically calculates solar array voltage and current profiles based on user-defined parameters. These profiles can be sequentially sent to a Magna-Power Electronics power supply, which will emulate defined characteristics. The user can define a limitless number of profiles to be emulated and sequenced over a given time period. Design and production validation for photovoltaic connected electronics requires a photovoltaic emulating power source with flexible output characteristics. Inverters and specialized DC-DC converters employ maximum power point tracking (MPPT) control algorithms to maximize utilization of nonlinear energy sources, such as solar panels and wind turbines. For development and manufacturing, using photovoltaic arrays for validation is costly with uncontrolled source characteristics. By utilizing a power supply with user-programmable output characteristics, the user can evaluate the full range of power conditions. After the profile is defined, it can be transferred to the power supply for either static or dynamic emulation. A time dependent parameter defines how long the power supply should emulate that profile before loading the next profile in the sequence. The user selects the desired solar panel technology, nominal temperture, irradiance, voltage and current values. Each V-I profile is then defined only by new temperature and irradiance values. The rest of the parameters: maximum power point (Vmp, Imp), open circuit voltage (Voc), and short circuit current (Isc); are all calculated automatically in accordance with the EN50530 standard. The user defines the maximum power point (Vmp, Imp), open circuit voltage (Voc), and short circuit current (Isc). The profile is then generated based on these parameters. The user defines up to 50 current and voltage points for the power supply to emulate. The power supply performs a piecewise linear approximation between points to provide a smooth output curve. The European EN50530 standard provides a new algorithm for proper solar array modeling. PPPE 2.0 incorporates this model, furthermore allowing the selection of thin film or polycrystalline silicon parameters. Defining a curve is as simple as specifying desired open-circuit voltage, short-circuit current, and maximum power point. Alternatively, manual parameters can be entered for more customized modeling or profile importing from an external file. 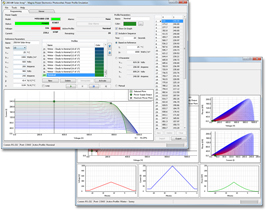 A new live output viewer provides six graphs of instantaneous output parameters versus time. This data allows the user to visualize fluctuations in voltage, current, and power over time. An interpolation function was added to automatically generate transitional curves. This functionality enables smooth transitions from one curve to another over a user-defined period of time. Customizable data logging functionality was added, allowing for report generation and data analysis using external tools. Data is exported to a comma-delimited (.csv) file. Leverage the ease of profile generation in PPPE and export the generated SCPI commands for integration into a separate programming environment, such as LabVIEW/LabWindows.